There are 345,394 people under 18 living in Philadelphia; that is 22.2% of the population, according to the US Census Bureau. In an ideal world, no child should see their rights violated (especially their physical integrity) but the reality is that ensuring that no one becomes a victim of child abuse is a titanic task, almost impossible to achieve in a city with rates of poverty and violence among the highest in the country. Although those aren’t necessarily the only factors that explain this problem. In Philadelphia, things like the abuse of children or the neglect of their right to be cared for happen a lot; so much that with almost 10,000 cases, the city has the fourth largest child welfare system across the nation. The law is also clear in pointing out that every person under 18 is susceptible to being a victim of this type of circumstances. 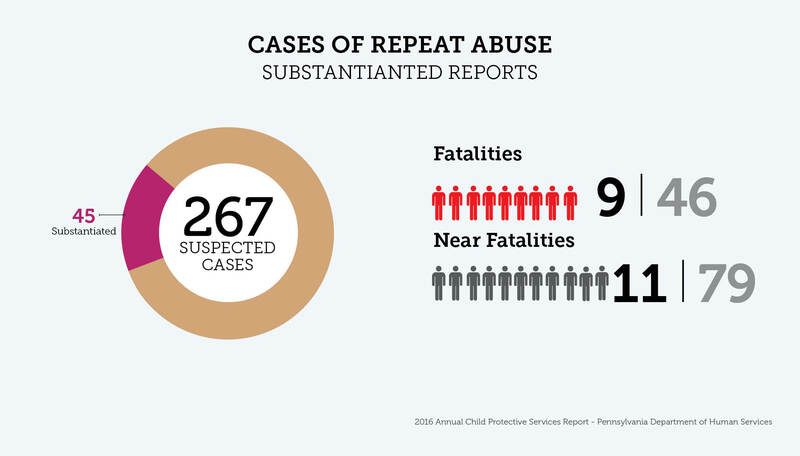 According to Pennsylvania's most recent Annual Child Protective Services Report, issued by the State Department of Human Services, Philadelphia - with 5,367 reports - is the county that contributed the most to the number of alleged abuses last year throughout the Commonwealth, that had 44,359 complaints, 4,597 substantiated reports. Of those 5,367 reports received and investigated during 2016, the city’s Department of Human Services (DHS) established that 847 constituted substantiated cases of child abuse and / or neglect, given the evidence collected. The gender of victims was female in 59.3% of the events. 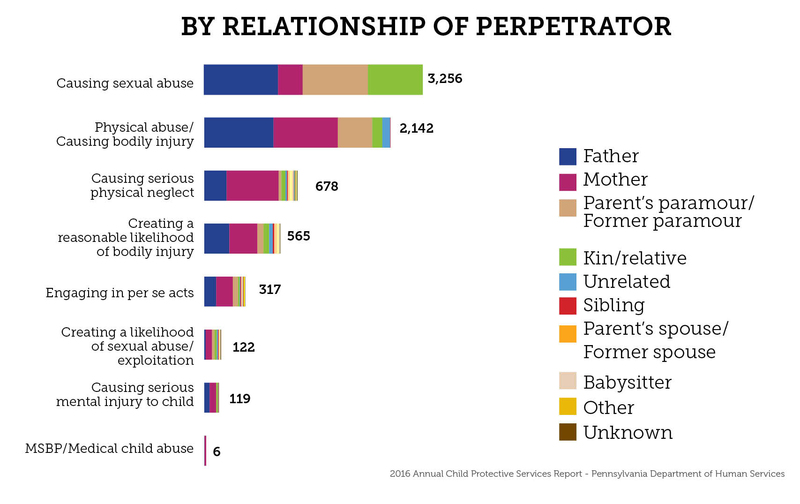 The majority of reported complaints at the state level also account for the most common type of abuses children suffer are sexual abuse (47.5%) and physical abuse or bodily injury (29.6%), serious physical neglect (8.3%), reasonable likelihood of bodily injury (7.5%) and abuse engaging in a per se act -any act that constitutes itself an abuse, even without evidence of physical harm- (4%). The numbers – although they seem less relevant when they’re compared to the total population of children in the city – hide a dark picture: In issues like this, there are always underreported cases that never get attention. In addition, when compared to the rate of events reported at the state level, the city is located very close to the regional average and exceeds it in substantiated cases. According to the same report, the rate of complaints made in Philadelphia in 2016 was 15.5 per 1,000 children, while in Pennsylvania that rate was 16.3. Regarding the rate of cases of proven abuse or neglect, the city had 2.5 per 1,000 children while the State had 1.7. But if at the regional level Philadelphia is leading this problem, the city doesn’t do better nationally. When the life or well-being of a child is in serious danger, the system takes them and relocates them in a safe environment, out of the reach of where their rights were violated, which in most cases is their own home. 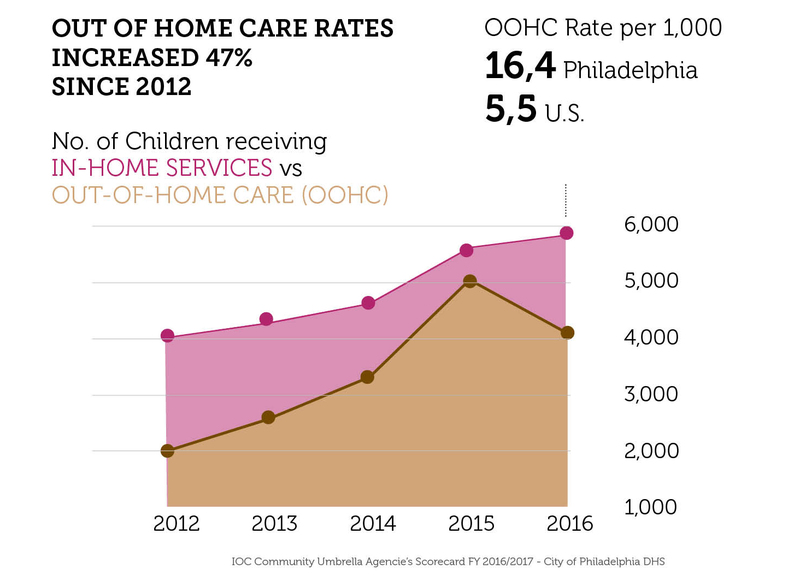 According to the latest evaluation of the Improvement Outcomes for Children, a major reform to the child welfare system, this year the city has served about 6,000 children in "out-of-home care” modality (temporary homes) at a rate of 16.4 per 1,000 children, much higher than the national rate, which is 5.5. These figures can be read in two ways: the optimistic perspective, which focuses on attentions: the number of children protected or placed in temporary homes while the DHS investigates and finds a permanent solution for the threat. And the other not-too-optimistic perspective, which realizes that while measures are being taken to improve the quality of services along with the quick response of the authorities and the agencies, both child abuse and neglect are still the main causes of violations of children's rights. Cynthia Figueroa, Commissioner of Philadelphia’s Department of Human Services (DHS) – the entity in charge of addressing these issues –, prefers to look at it the first way. "One of the things that we are very proud of in Philadelphia is that, of that number of 6,000 kids who are in placement, more than half of those kids are living in what we called kinship care: a family member, a relative or somebody who is known to that child." Figueroa is very aware of the challenges that this problem represents, although she points out that the increase of reports is an effect of the reforms that the legal framework suffered as a result of the Jerry Sandusky scandal, the former football coach of the Pennsylvania State University convicted for child sexual abuse. “There were 24 changes to the Child Protective Services Law, and it increased the kind of issues that were considered abuse. It increased the length of time that you can report abuse and also who could be the reporter,” she says. “What we saw from 2005 to 2017 was a huge increase of referrals into the child welfare system,” Figueroa adds. The DHS Commissioner talks about to the cultural effect that CAPTA has had by creating a sense of responsibility in more people. 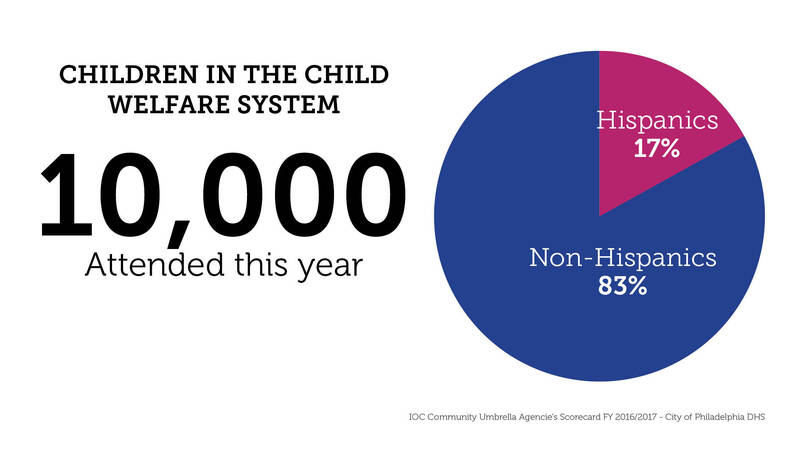 This effect has contributed to a rate-increase of 46% in attentions into the child protective services since 2012. Since Figueroa took her position as head of the DHS, she has led the efforts of the city to improve both prevention and attention services for victims of child abuse. One of those efforts is the implementation of the Improving Outcomes for Children (IOC), a strategy that sets the operational standard for the 10 local community-based organizations or CUA’s (Community Umbrella Agencies) that serve families and children in conditions of vulnerability. Just a couple of months ago, the DHS published the "Community Umbrella Agencies’ Scorecard”, an evaluation of the services offered to children victims of child abuse and neglect. In five categories - superior, proficient, competent, unsatisfactory and critical - only three agencies met the basic expectations of DHS by showing competent performance, while the remaining eight were unsatisfactory. Although the results are far from being good, Figueroa focuses on the positive aspect of the evaluation: it is the first time something like this has been done in Philadelphia and with it the city established a baseline from where it will measure all progress. “We are already starting to see gains so I am very confident that in next year’s report we’re gonna see progress,” said the official. The IOC evaluation made it possible to identify those areas where each CUA needs to concentrate in order to improve their services. Some of those areas are understanding the IOC as the single guide for the care of children, as well as to develop a more articulated work with families, parents and communities with the purpose of reducing the rate of children placed in temporary homes. Among the achievements that Philadelphia has made through the implementation of the IOC since 2013, the DHS points out that 46% of victims live in kinship with a family member, while 56% live within five miles of their homes, and 2,021 children have found a new permanent home. Another success is that the city decreased the caseload for every case manager: from 13 families in 2016 to 11 this year. The goal is to reach 10 families (or cases) for each manager. According to Figueroa, these achievements have a direct impact on the quality of service provided by DHS and CUA. "Success for our office is that we ensure that only the families who actually need our intervention are the families that come to our attention, and that when children and families come to our attention (…) we provide the best quality service,” she said. 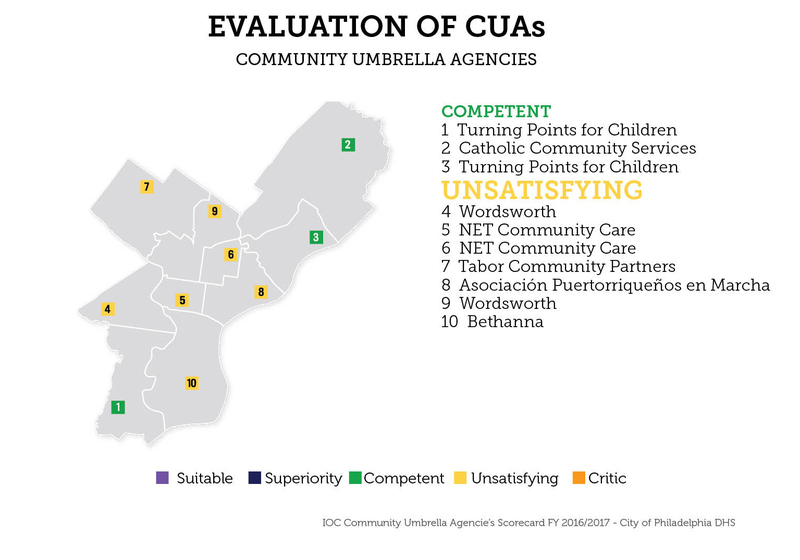 With the CUA's Scorecard, there is no other option than improvement. The city’s Administration plans to invest over $93 million next year to keep protecting kids from child abuse. In the future, the CUA’s that obtain higher rates in the scorecard will be able to access these resources. In summary, these figures show that child abuse is a serious problem in Philadelphia, but also that thanks to the work and reforms carried out by the DHS, this problem is increasingly visible, a fundamental step forward to keep fighting and -perhaps- defeating the problem.